You want to buy a house in Perth, but you’re living overseas and can’t attend any home opens. 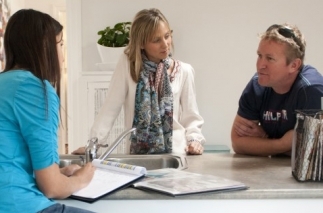 Would you trust your dad to put an offer on a house for you – without seeing it in person yourself? 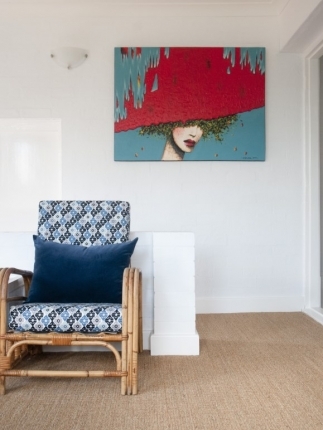 This East Fremantle cottage was bought, sight unseen, by globetrotters Vanessa Fordham and Karl Cramond, the founders and owners of exclusive wedding and events styling and hire company Villa Kula. Since selling their business in New Zealand and moving to Perth, Vanessa and Karl had been alternating living in a beach house in Falcon and in the warehouse above their showroom in Perth. But it was time to move. ABOVE: Villa Kula owners Karl and Vanessa's dining space with antique table and Bentwood chairs. Photos Meghan Plowman. Photo Meghan Plowman of The Orchard. Beautiful Boots on watch duty, who I had the pleasure of meeting before at Vanessa and Karl's showroom. Vanessa said Boots had been "washed and blowdried" specially for our interview and photo shoot and she was wearing her fetching kerchief. Photos Meghan Plowman. LOUNGE LOVELINESS: Some of the things Vanessa and Karl own are Villa Kula pieces that can be hired – Vanessa and Karl offer a full events styling service. Even rugs and beautiful crockery can be hired amongst their services. 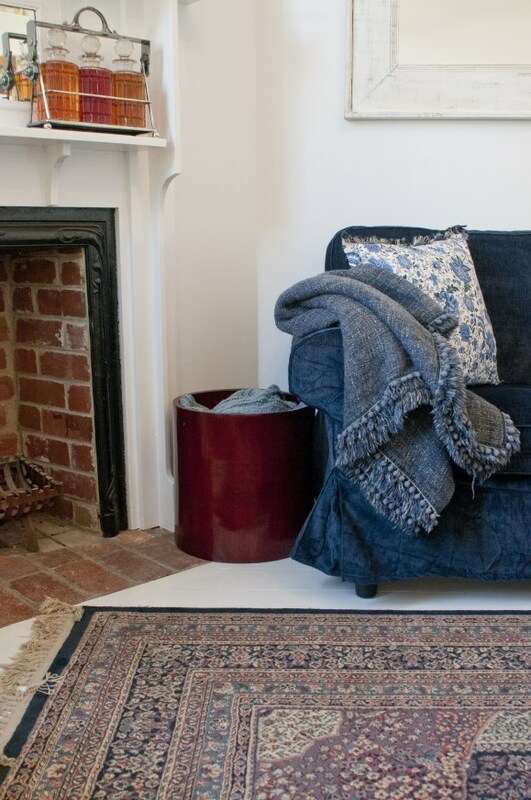 They are also launching an online store soon, selling their gorgeous wares including cushions and rugs. Photo Meghan Plowman. 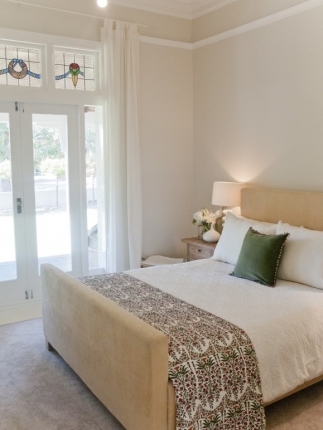 GUEST SUITE: The light-filled guest suite is Vanessa’s favourite room. She even has another rack of enviable clothes and shoes in here! 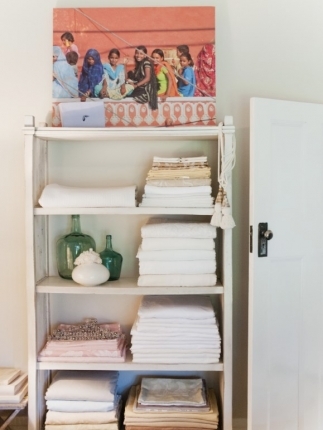 The beautiful bed linen was from Shedwallah in Fremantle and she tells me I have to go there – it’s a big shed full of beautiful textiles and rugs from India and Morocco. She doesn’t need to twist my arm. This is the bad bit of my job! Photos Meghan Plowman. WE LOVE VILLA KULA: Home owners and Villa Kula founders Vanessa Fordham and Karl Cramond. They have to be two of the nicest, most friendly people you could meet - the kinds of people you meet and feel like you know them already! 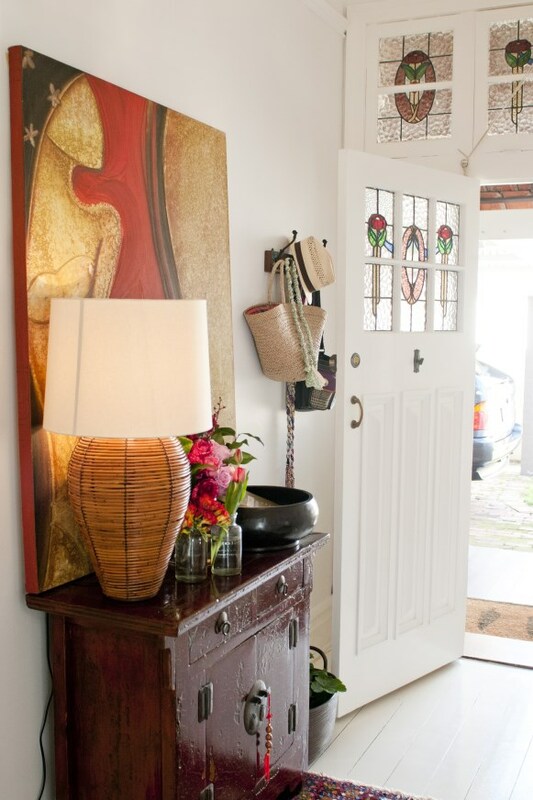 As a little side note, while Vanessa loves the leadlight entry door she cannot stand the little leadlight pendant light in the hallway and is desperate to replace it when they do more renovation work! Photos by Meghan Plowman of The Orchard. Loving the beach house they'd renovated in Falcon (on a block just 200m from the shore) but tiring of the one-hour commute from Falcon to work each day, they decided they needed to live closer to work (although not directly above it anymore!) and started house hunting. As the owners of Villa Kula, Vanessa and Karl offer some of the most absolutely beautiful events and wedding styling I have ever seen (you have to check out the unbelievable photos of their work on their website) and often travel around the world to buy hire items for the business. 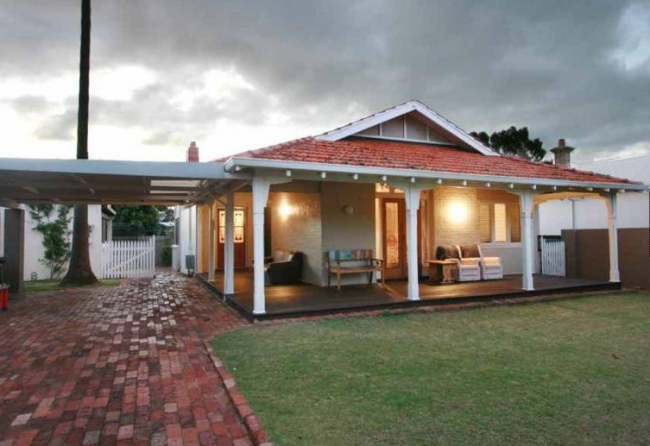 While in Bali on a buying trip, they were browsing online and came across a listing for this 1920s East Fremantle cottage. 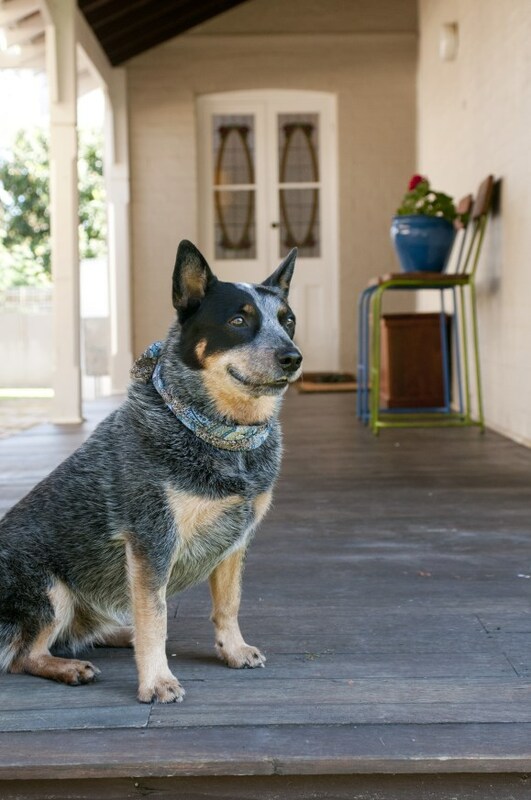 Smitten with these photos of the wraparound veranda and the big expanse of lawn in the front garden, Karl and Vanessa instantly thought the house could be great for their love of outdoor entertaining and their beloved blue heeler Boots. Only trouble was, they couldn’t get to the home open themselves. 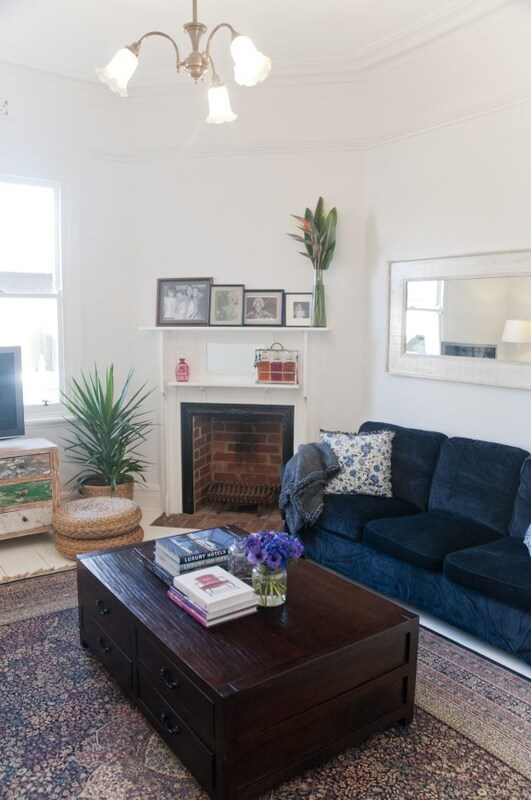 ABOVE: When Vanessa and Karl saw this photo of the home in the real estate listing, they instantly thought the big front lawned garden would be great for their blue heeler Boots. 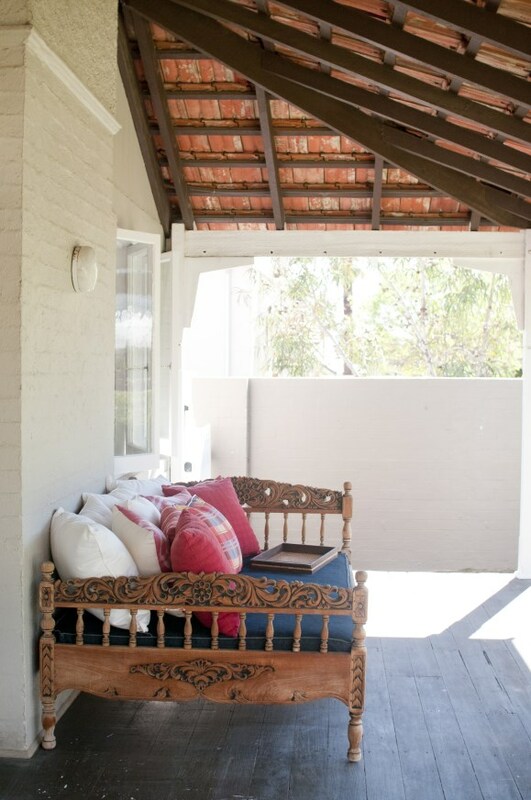 ABOVE: Another picture of the real estate listing of the lovely front veranda that caught Vanessa and Karl's attention. But while the interior had character features and tons of potential, it was not quite as lovely as the facade. 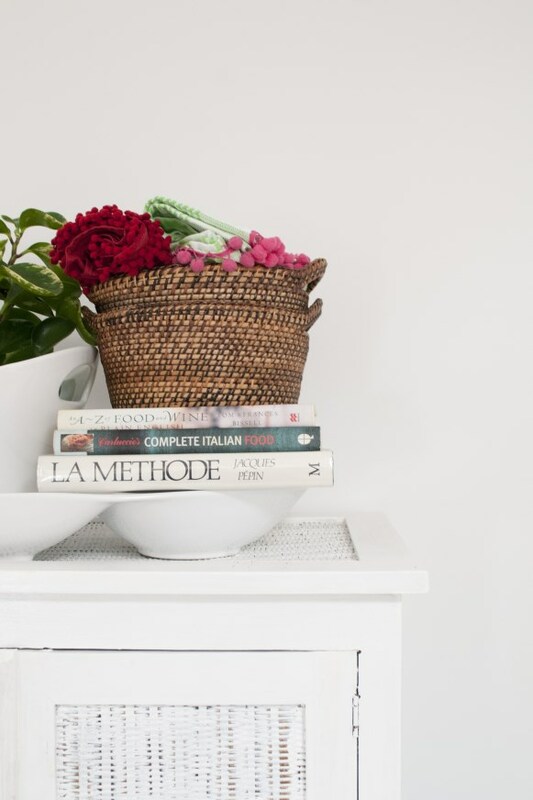 The house was a rental and the inside was dated, dark and disjointed, with some walls painted maroon and with stripes, a light-filled but old laminate kitchen, and the jarrah floors were in need of some love. 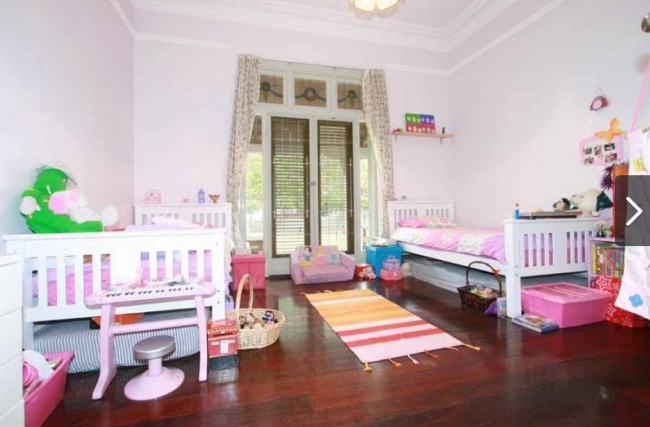 ABOVE: The hallway, guest bedroom and sunroom, used as a playroom. The 1920s house had fantastic bones but as a worn-out rental it lacked character and a cohesive look. 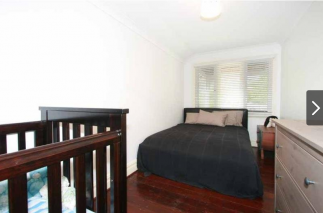 BEFORE: The main bedroom was used as a children's bedroom. 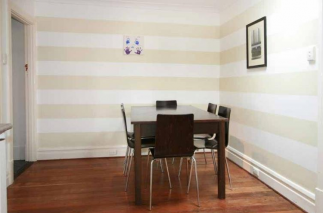 ABOVE: The dining room off the kitchen had been painted in stripes and the floors direly needed rejuvenating. Until that extension project happens, Vanessa and Karl wanted to give the house an inexpensive update. So they spent five weeks doing a cosmetic renovation. 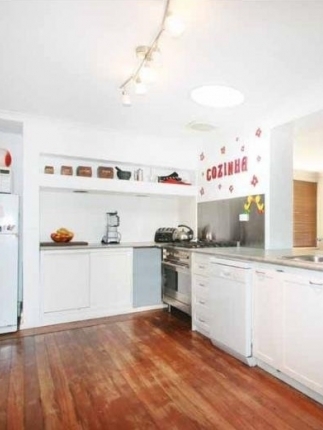 It’s now gone from blah rental to light, bright, beachy and chic. The real estate agent came back and couldn’t believe the change. And Vanessa and Karl love it (and being in East Fremantle, they’re only a couple of minutes’ drive to the ocean, too). We are sitting at their kitchen benchtop drinking their amazing coffee and I just HAVE to ask about the white-painted floorboards! Painting floorboards (and other timber accents) white is not at all uncommon in Europe – while here in Perth, a city of wood purists, it’s extremely rare. Some people act like it’s a crime. 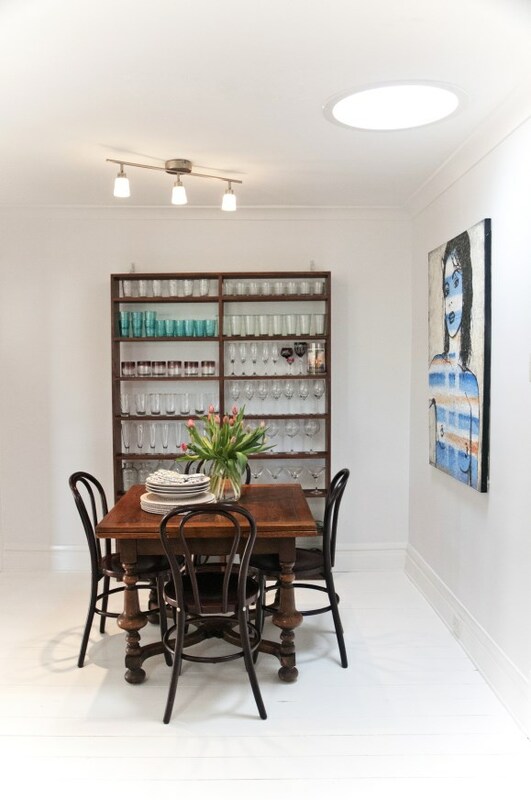 BEACH FEEL: A David Bromely painting sits perfectly in the dining area. Before this house, Vanessa and Karl renovated a 20-year-old house in Falcon just 200m from the beach. 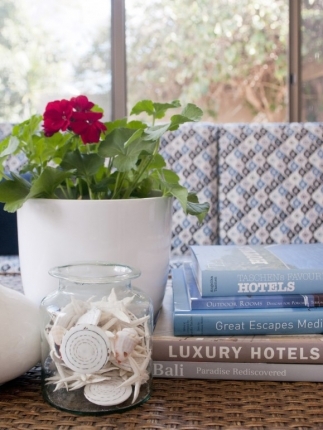 They wanted to give their East Freo home that same relaxed, inviting coastal feel. 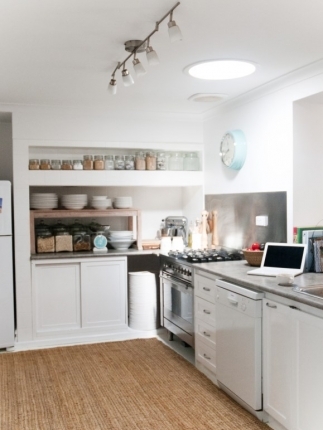 The white-painted floors are one of the elements that give this house its fresh, beachy feel. “We wanted our house in Falcon here in Perth,” says Karl. Photo Meghan Plowman of The Orchard. 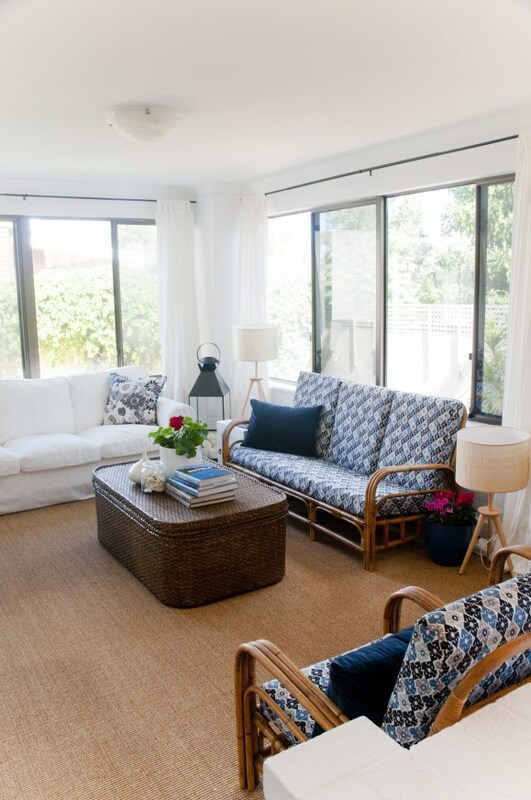 SUNROOM: Once dark and dull, the sunroom is now light and beachy. 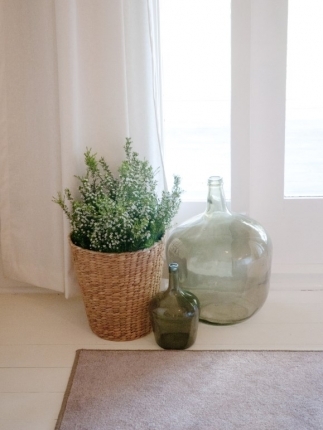 Vanessa and Karl put in sisal flooring and picked up the gorgeous lounge setting in the sunroom from vintage heaven Turnstyle Collectables in Nedlands. They had them recovered in this gorgeous blue and white fabric. MAIN SUITE: The old timber wardrobes in the bedroom were left in the house from the previous owners. Vanessa and Karl painted them white. Photo Meghan Plowman. 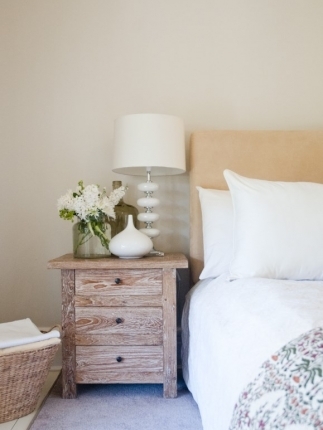 Main bedroom details. Photos by Meghan Plowman. They love the floors so much that Karl adds that when they eventually extend out the back of the house, they think they will add new floorboards and paint those white too. Vanessa says the floor is not hard to clean either - yes, even when Boots comes in when it’s been raining and stomps around with her muddy paws! 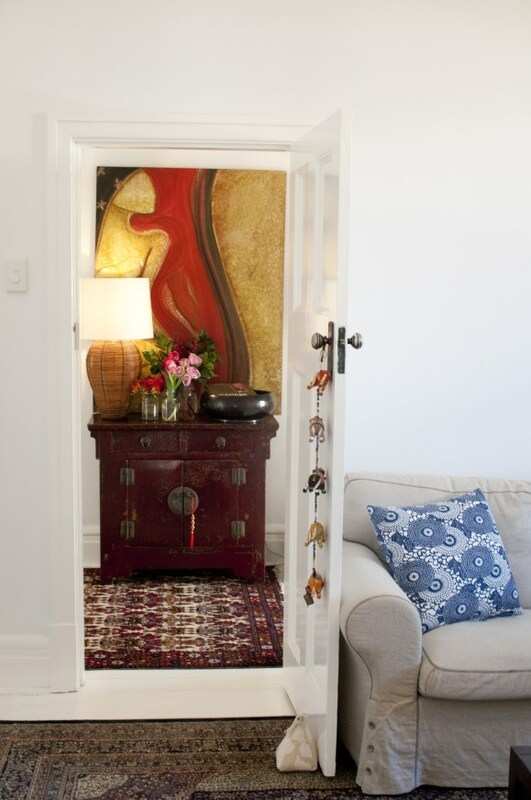 OFFICE: The home’s small, cosy third bedroom was turned into a study and combined walk-in robe for Vanessa's wardrobe and her impressive shoe collection. Photos Meghan Plowman. 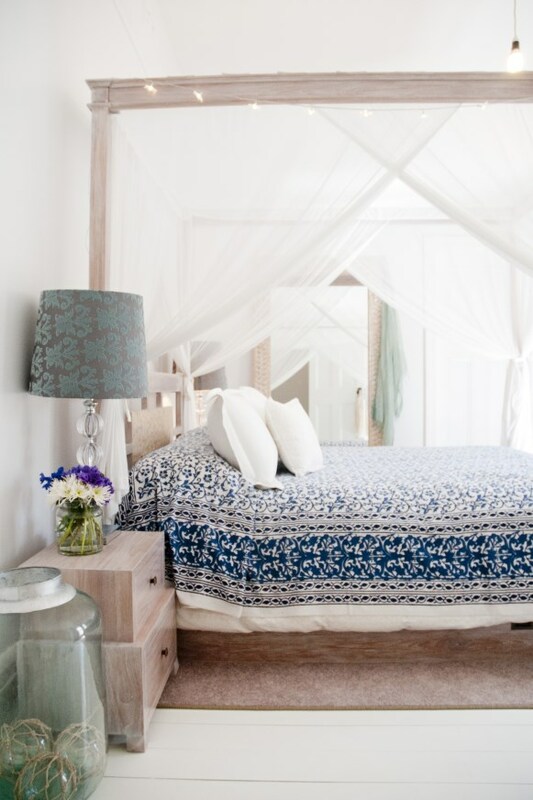 ABOVE: Vanessa and Karl found the veranda's handcarved day bed on a trip to Bali. Styling and photos Meghan Plowman. All photos Meghan Plowman of The Orchard. Styling events and parties on some of the most beautiful beaches and yachts around the world has given Villa Kula owners Vanessa and Karl an instinctive feel for gorgeous beach style at home. Go for blues, sea greens, lots of white, natural materials, wicker furniture and limewashed timber. 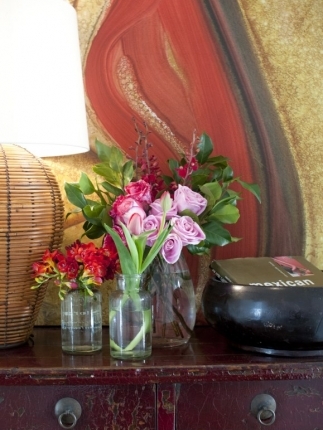 Add decorative accents like shells, blue and white patterns and lots of lamps. 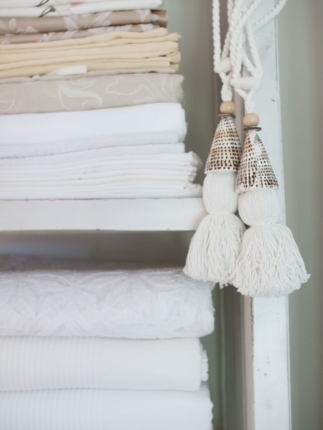 Consider sisal flooring and white-painted floorboards for a beach feel. 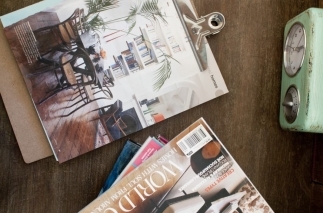 Collect pictures from magazines that have elements of things that inspire you and combine them to help you visualise the end result. TRAVEL BUGS: Karl and Vanessa have lived and travelled all over the world. Before bringing Villa Kula to Perth, they lived in a treehouse (yes, a treehouse!) in New Zealand. 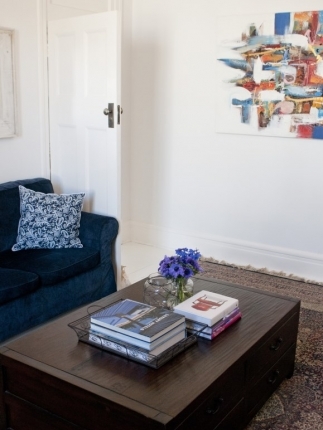 Their East Fremantle home is an eclectic mix of things from around the globe. Photos Meghan Plowman. A TEENAGER WITH TASTE: I love it when teenagers buy furniture. I was one of those kids! And so was Vanessa. 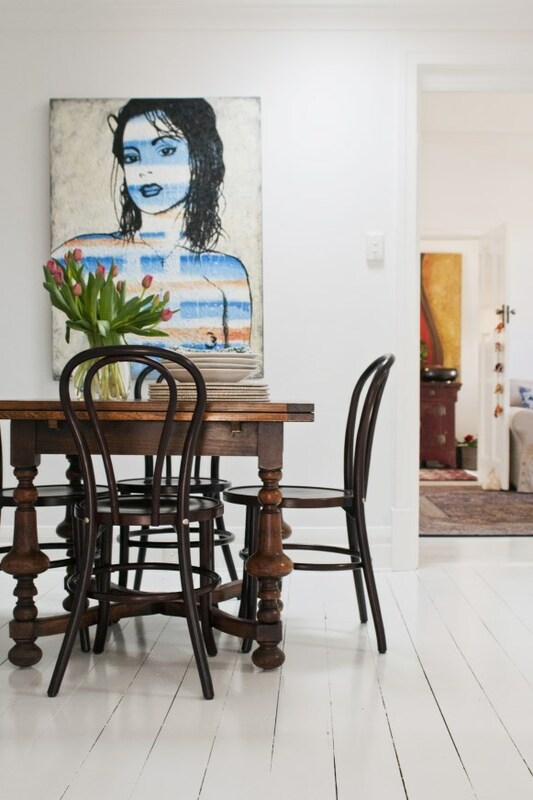 She bought the antique dining table when she was 15 from Trish’s Place in Fremantle. It can be extended to hold more people. The bookcase was left from the previous owners. “We love dinner parties,” says Vanessa. 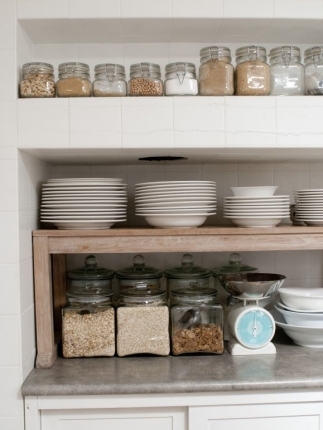 “Karl is a really great cook.” Photos Meghan Plowman of The Orchard. 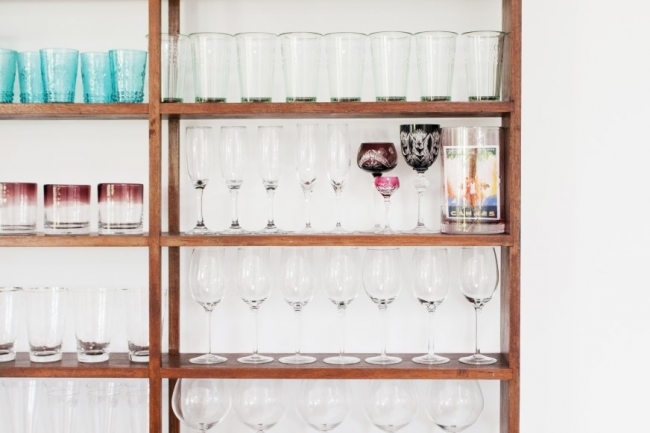 GLASS ON DISPLAY: The lovely narrow bookcase in the dining room was left in the house from the previous owners and now houses Vanessa and Karl’s crockery and glasses. “We love dinner parties,” says Vanessa. “Karl is a really great cook.” Photos Meghan Plowman. 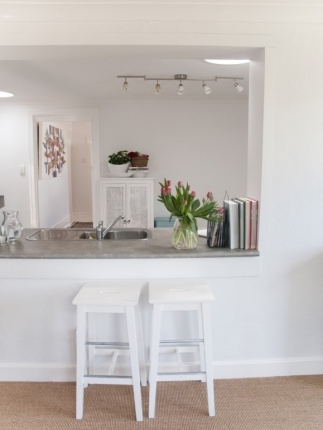 KITCHEN THEN & NOW: Not too fond of their former rental home's old laminate kitchen, Vanessa and Karl eventually plan to extend the house and put in a new one. For the time being, however, they’ve done a gorgeous job of giving it an inexpensive cosmetic makeoever and making it as pretty as possible for the time being. As House Nerd readers know, I’ve always loved smaller homes and this one is so gorgeous and feels so friendly – I feel like I could linger here all day. “It’s a small house but with two bedrooms and two bathrooms it’s perfect for just the two of us,” says Vanessa. “And the beast,” Karl adds. Vanessa Fordham and Karl Cramond, who founded and own exclusive events styling and hire company Villa Kula. You can follow Villa Kula on Instagram @ ilovevkxo or on Facebook. Vanessa and Karl live with their gorgeous blue heeler Boots. Wraparound front veranda, French doors, kitchen and dining, sunroom, lounge, two bedrooms, and one glorious office/walk-in robe! 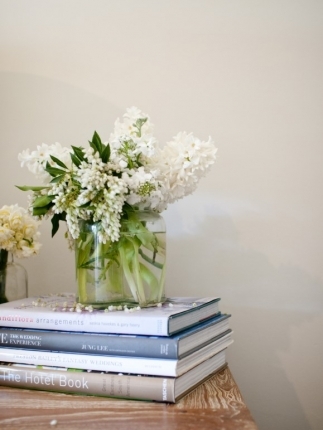 Stylist and lifestyle photographer Meghan Plowman of The Orchard. You can follow Meghan's amazing Instagram @meghan_plowman or on Facebook. Gorgeous place. I may be a little biased after spending this weekend paint our floorboards white. Wow good on you! It's a gutsy move! I just visited and had a little peek - it looks great. Can't wait to see more pics. I think it can really lighten and brighten a house up. I am so envious of your awesome kitchen sink! Gorgeous.... we have just purchased a house in Sorrento. 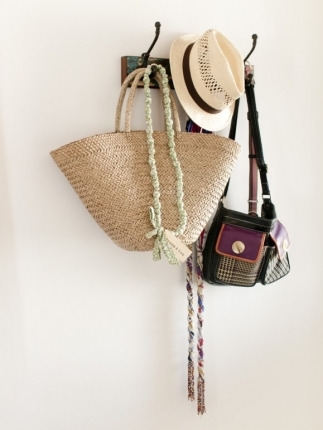 I plan on painting the floorboards white & this has sealed the deal :) Also love the sisal carpeting!! 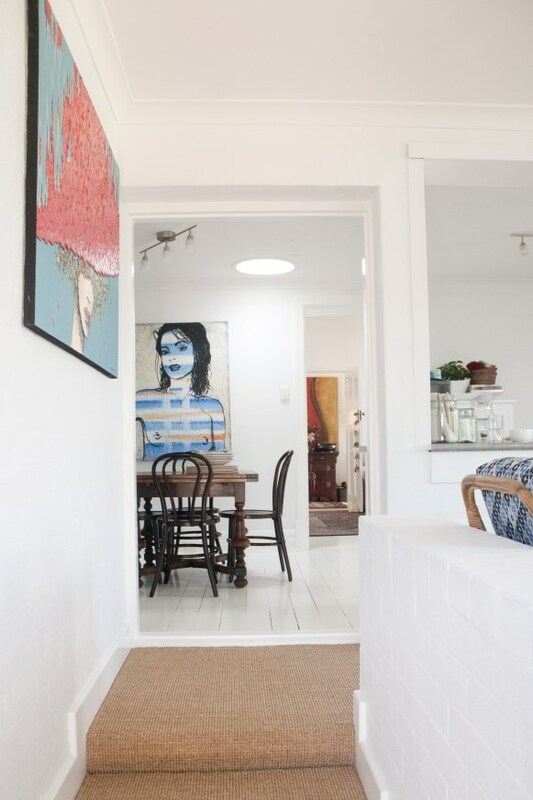 I am not in the least surprised you have always been a big fan of painted floors and sisal :) Can you believe of the hundreds and hundreds of Perth homes I have written about for my job, it is the first home that has painted floorboards! How beautiful is this place - different, gutsy, gorgeous. 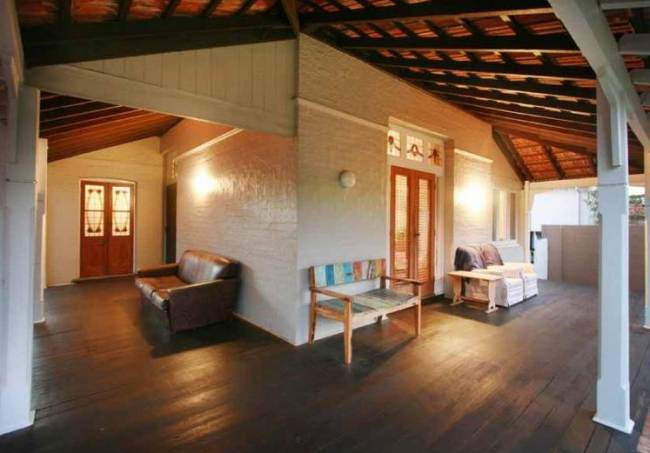 That verandah is pretty amazing you could do some serious entertaining out there. 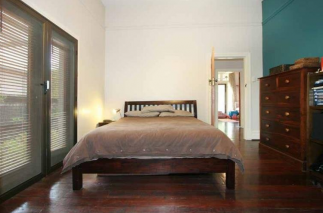 Im all for restoring jarrah floorboards, but if they were in really bad shape probably easier to paint over them. You must be getting heaps of inspiration for your own home from these home tours :) Falcon is a nice place to holiday and live, I use to go down there with my family for holidays a few times a year. Great spot! Stickybeak! Haha!! I love it. Going in the lexicon this minute. Love this house so much! Coming from NZ where I spent majority of my time between various holiday houses, the white & blues were a common feature. 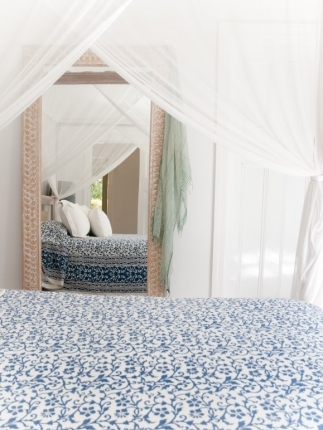 How fab would it be to have your place looking like a holiday house every day though! Ahhhhhh, the dream! I am thinking of painting the floorboards in my daughter's room. Would love any hints or tips for doing so. Your house is gorgeous. Love it. Hi Andrea, sorry for the late reply but here is the answer from the lovely Vanessa! 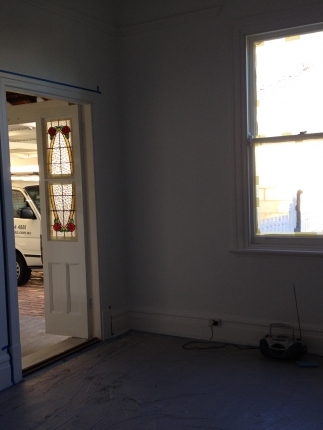 "There was quite a bit of prep work involved – including tonnes of sanding, two undercoats and two top coats. They used a 2 pot epoxy paint in gloss white for the paint. We did it in winter and it took a long time to dry, if she can wait till the weather is warmer that might be better – it was laid on very thick and took ages to dry. We still absolutely love it – only 2 things to consider. Hairy dog is a real nuisance, love her to pieces but wow the hairs – seriously the vacuuming I have to do is off the scale! Second thing, somehow whereever we have put rugs down the area covered has gone yellowy brown. Some areas much worse than others. We were thinking to repaint the floor again in maybe September so we get that lovely bright white sheen again. That’s it really. It still looks fabulous and beachy. Karl says he’s not sure he would do it again, I positively would yes. XO"
Maya, do you know what paint product they used on their floors? 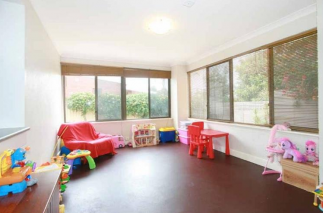 Im trying to pluck up the courage to paint our jarrah floors and need some technical advice! Hi Grace, here is the answer from the lovely Vanessa! 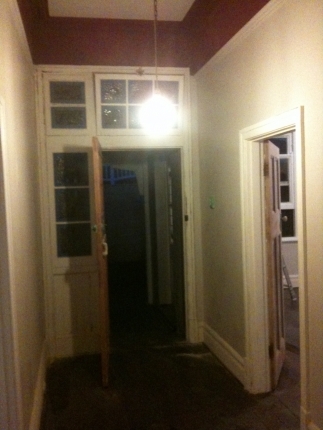 "There was quite a bit of prep work involved – including tonnes of sanding, two undercoats and two top coats. They used a 2 pot epoxy paint in gloss white for the paint. We did it in winter and it took a long time to dry, if she can wait till the weather is warmer that might be better – it was laid on very thick and took ages to dry. We still absolutely love it – only 2 things to consider. Hairy dog is a real nuisance, love her to pieces but wow the hairs – seriously the vacuuming I have to do is off the scale! Second thing, somehow whereever we have put rugs down the area covered has gone yellowy brown. Some areas much worse than others. We were thinking to repaint the floor again in maybe September so we get that lovely bright white sheen again. That’s it really. It still looks fabulous and beachy. Karl says he’s not sure he would do it again, I positively would yes. XO"
Hi Grace, forgot to mention, I recently learned from an interior designer friend that apparently white oil-based paints tend to yellow over time when not exposed to enough sunlight, which might explain why the section under the rug of Vanessa and Karl's place has yellowed a bit. In our house the same has happened with some door frames and doors.